Home > Law Books > Forms > Real Estate Transactions - Structure and Analysis with Forms, 2018-2 ed. 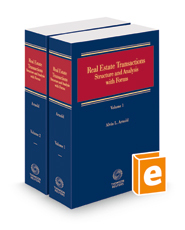 Real Estate Transactions - Structure and Analysis with Forms, 2018-2 ed. Including advice from leading real estate experts, the title covers sales, financing, ownership, and taxation issues. You will find ready-to-use forms and checklists.